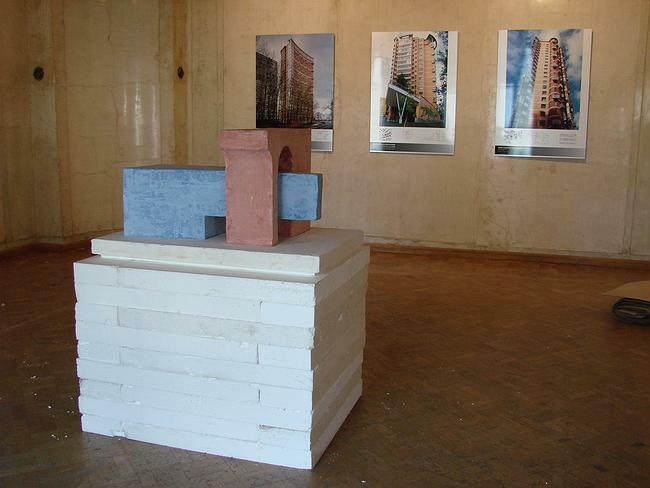 The Museum of Architecture is currently staging a solo exhibition of the architect Alexey Bavykin. Alexey Bavykin’s architecture is considered to be ‘original’. There maybe arguments on that, but obviously this architecture is not quite usual. 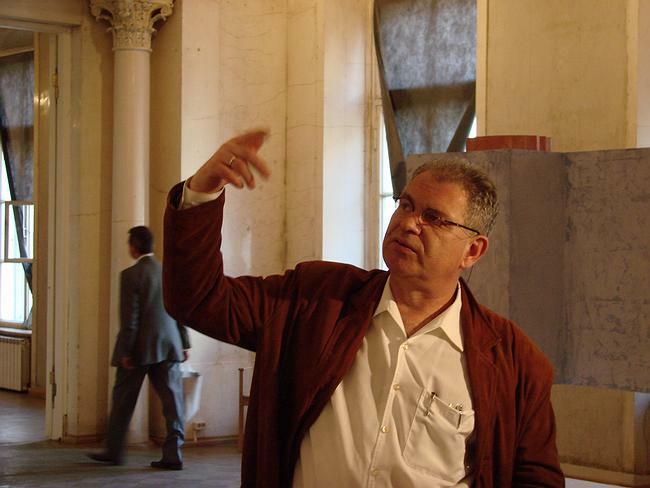 In the foreword to the catalogue Vladimir Sedov, Doctor of Philosophy in Art History, gave the exact definition to it: ‘talking architecture’. Also he rated it to the ‘third area of visionary architecture’ and the ‘forth modern Moscow style’. So, evidently, the exhibition in the Museum of Architecture, features the phenomenon and style, though represented by the only one architect and his studio. First, it seems to be closely related to the critics’ pet subject – visionary architecture fancies of concept contests over 1980ies. 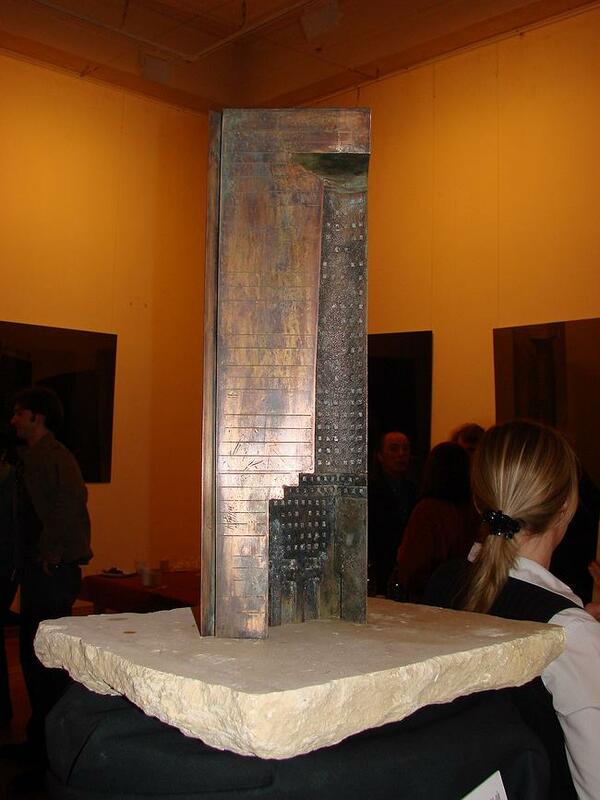 To the point, one of the momentous projects of that kind - the bronze ‘print’ of skyscraper-column by Adolf Loos that won the second place on the contest ‘Style 2001’ – meets the visitors, entering the first exhibit hall. Further, despite the expectations, there are fewer recollections on visionary architecture contests. The show is more focused on the already existing projects, and realization of the others. It is more like the report of a practicing architect then retrospection of the visionary architect. The searches of 1980ies are represented briefly, in some pictures, which are much less then in the published catalogue. 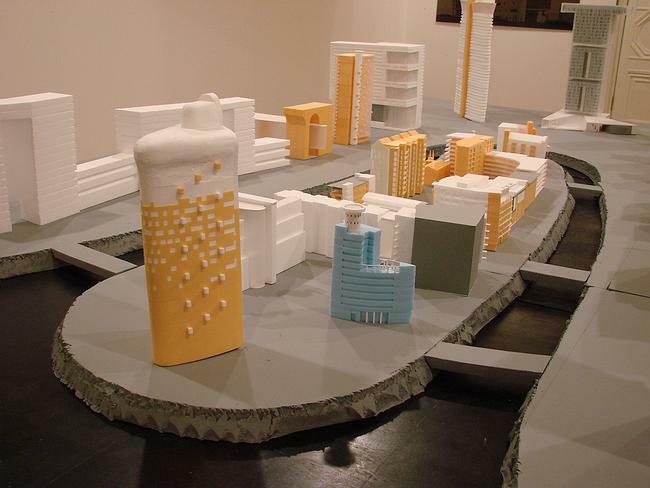 There is no evident division between visionary architecture period and ‘material’, like there is no evident division between the ‘left overside’ youth experiments and ‘separated’ practice. At any rate, there is no well-defined divide. But still, it doesn’t mean there is nothing of that kind and the evolution of the architect’s work can’t be traced. 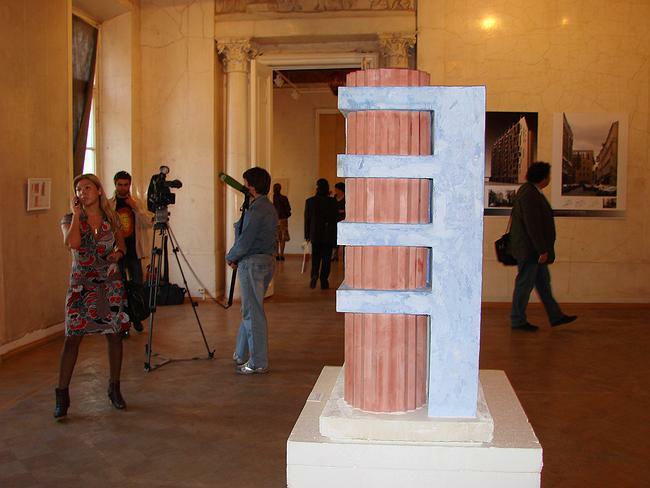 Remarkable for our days completeness and coherence of study of modern architecture visualization is observed in the progress from the bronze print of Loos work to the house-column in the 3 Avtozovodski proezd or, from the pine columns of the countryside house of 1990th, to the wooden order in Brusov pereulok. Summarizing we may also say that the architect Aleksei Bavykin, according to professionals, did not fantasize much at that visionary architecture period. 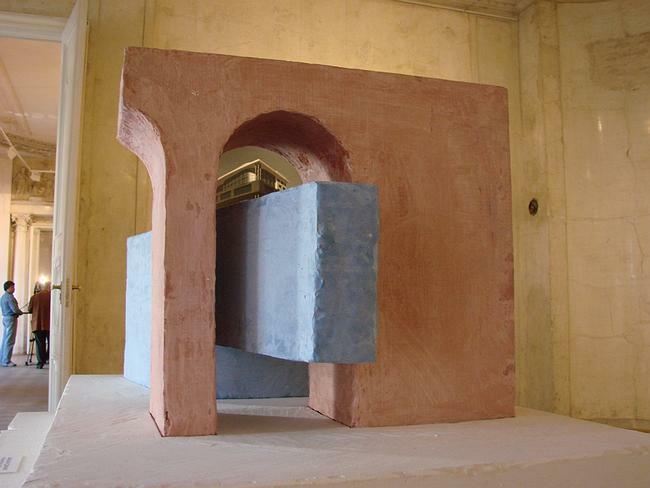 But he continued to carry on working that way, improving the unbound imagery of visionary architects. For example, he designed a restaurant in the shape of a frying pan. Designed a skyscraper that looks like a taking off airship and also columns in the form of trees, which may grow any height they feel like. The exhibition has been keenly directed: it is terse – there is much room left. But it is already full of impressions. 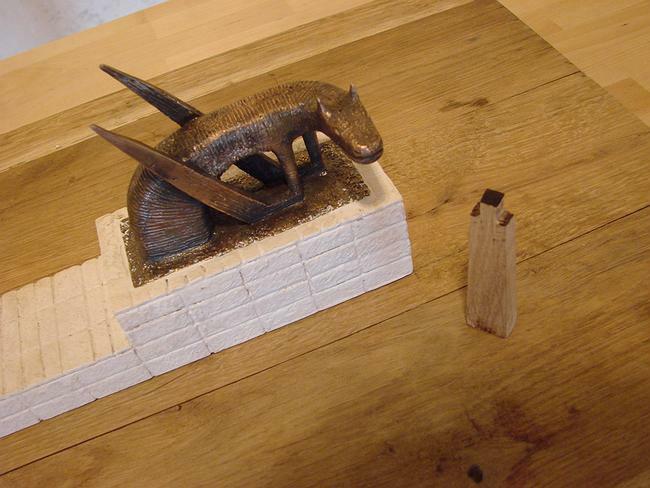 There is a large sculptural item, the ‘offspring’ of the project, which is aimed to explain the figurative meaning of one of the hugest Bavykin’s project in every hall. 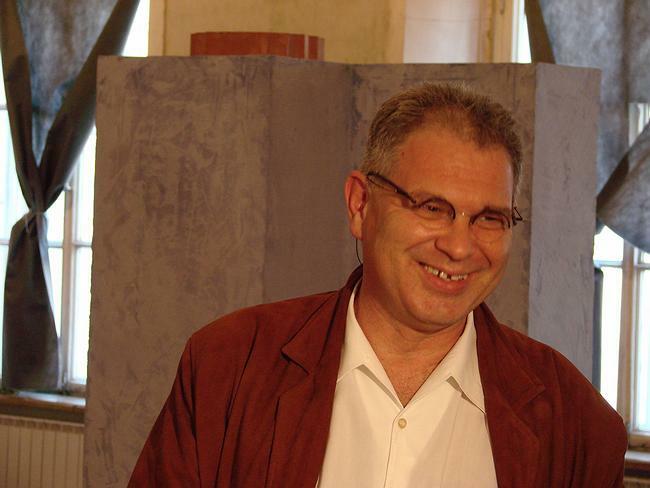 He has designed the four projects co-authored with the artist Alexander Jikia. They look deliberately man-made and are painted in two colors to make the interpenetration of the architectural volumes more clear. Like the giant fluted column and the console grasping it. Or the ruined arch with an avant-garde nose stuck in it. 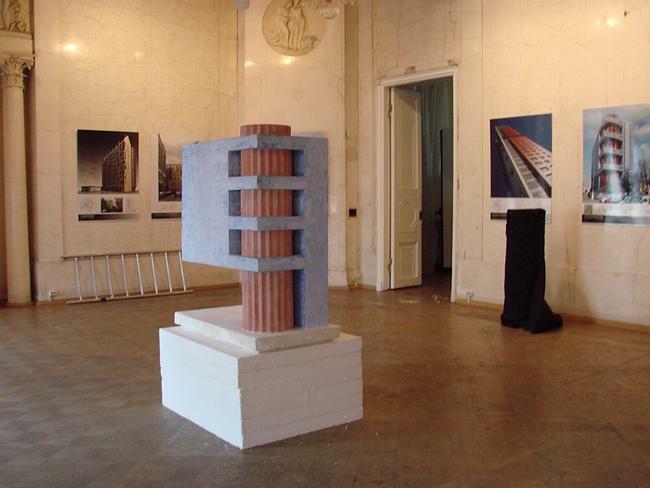 Hereby, the ‘architectural sculptures’ both ‘are carrying’ the space and are interpreting the art of architecture displayed on the stands. The other two model objects were designed in association with Boris Cherstvyi. The hall with gold monochromatic photographs meets a visitor. They are presented such a way that when anyone is passing by they appears as monuments of ‘historic’ avant-garde. Then go stands with constructions, projects and miniature frames with original drawings and sketches. Notably, the graphics of 1980ies and modern ones are jumbled, illustrating that there is no significant difference between them. Among the graphic arts there is another project done in collaboration with Alexander Jikia. 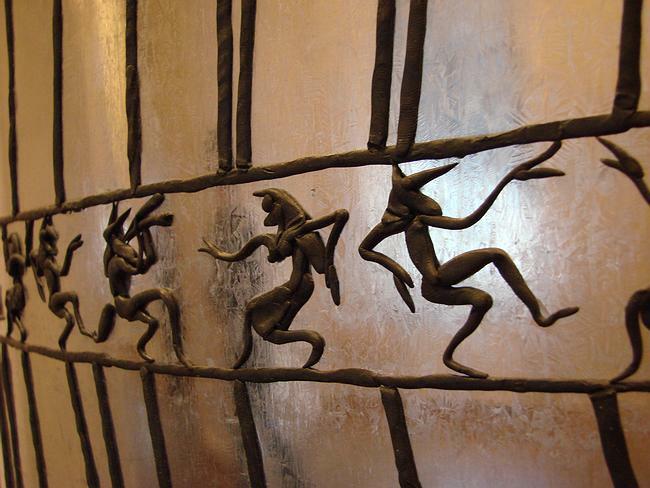 It is the ‘Greek house’: curved mirrored surface with the plasticine lattice and ornament of the dancing Greek stuck on it. 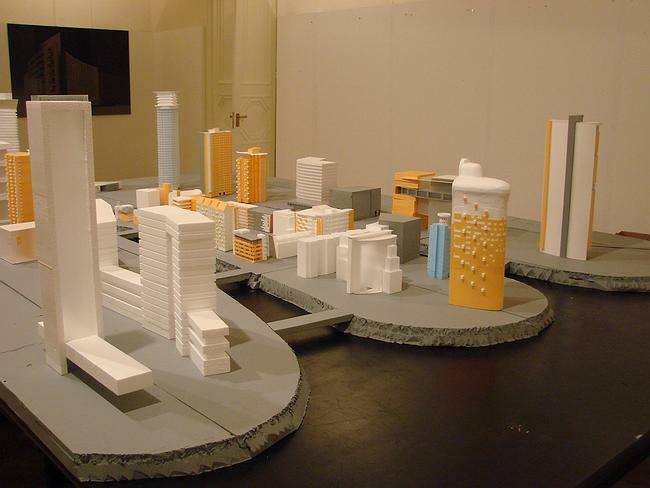 The final emphasis of the exhibition is the last hall with orange-and-white building miniatures, designed by Alexei Bavykin. Altogether they represent a small town with a river, which resembles Moscow Obvodnoi Kanal, but much more curved. In the center of the peninsula the buildings are smaller. The large ones are placed closer to the border. Its name is ‘Approved Town’. There is a shade of humor that all the projects inhabiting it, have already gone through official channels and may leave peacefully gathering together and waiting to be put into life - all-time dream of architecture.